Veteran journalist and author Joseph C. Goulden offers a good review of Ted Geltner's Blood, Bone and Marrow: A Biography of Harry Crews. 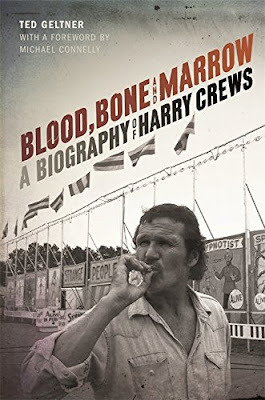 Reading the novels of Harry Crews is akin to walking into the freak show at a third-tier Southern carnival. The author (who died at the age of 76 in 2012) had the knack of taking human sub-normality to unbelievable lows, making one wonder whether such persons actually exist outside the tortured bounds of his mind. Savage dog fights. Swarms of snakes. A geek who eats an automobile, in bite-sized chunks. A former prizefighter who knocks himself unconscious with a right hook to his own jaw. A business mogul who uses the bodies of failed salesmen as mulch for the corporate greenery. Let me be candid: Harry Crews is truly an acquired taste, and for even a reader who loves Southern-fried fiction, his works can be disconcerting. Nonetheless, his 30 novels have made Mr. Crews somewhat of a cult figure in a segment of the literary establishment — “grit lit” was a favored term. A New York Times critic recently called him “one of the most original American voices of the second half of the 20th century.” I would emphasize the word “original,” for Mr. Crews was truly sui generis.